The K700TST cold water electric pressure washer, producing 2,500 PSI at 3.3 GPM, is for industrial and commercial use; perfect for the professional who needs to clean within a factory or food processing plant, for a vehicle wash bay, or use on a farm washing animal pens. What distinguishes this KrÃnzle unit from the competition are the unique capabilities of the KrÃnzle pump and the uncompromising German quality. The KrÃnzle pump can run dry and bypass longer than its rivals, as proven in independent laboratory tests, making it more durable and reliable than the competition. The K700TST, designed for daily use, is equipped with a KrÃnzle AQ industrial grade pump and is powered by a KrÃnzle 220 volt, 25 amp, single phase, TEFC electric motor. Special features include auto on/off gun-jet control with 30 second delay combined with a safety shut-down after 20 minutes that prevents accidents and a unique high pressure soap design that delivers 20 percent more cleaning power at tip. 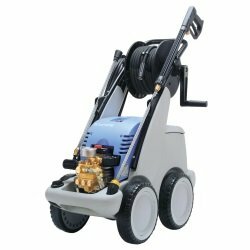 Featuring a steel frame with a plastic cover that holds accessories and hose reel, this pressure washer provides a convenient and powerful cleaning package. The K700TST comes with all the accessories you need to include: professional gun-jet lance, 65' wire braided hose on a hose reel, gauge, safety coupler screw connections, a knife-jet nozzle for high pressure wash, and for difficult to clean dirt, a hard hitting Industrial Dirt Killer turbo nozzle. With a cleaning power rating of 8,250 cleaning units, the K700TST provides the professional cleaner the latest in advanced pressure washing technology. Measures: 31-inches length by 23-inches width by 40-inches height. Weight: 196 pounds. Metal and plastic finish.